Benefits: Eliminates data entry mistakes and substantially minimizes programming because the tool paths are created from the CAD file. Advanced pocketing routines with unlimited islands and helical plunge. Benefits: No limits! There' s no limit to the complexity of the island or boundary shape. No limit to the number of islands within a boundary. Helical plunge eliminates the need for center cutting end mills and reduces tool load. The Lines and Arcs feature illustrates how well our control simplifies complexity. Program any complex contour using Lines and Arcs without the need to trig out missing data. Why Hurco? Our helix segment is the best in the industry. In addition to using it for thread milling and helical plunging, you can program an arc segment by defining the X start, the Y start, and the polar sweep angle--the control calculates the arc end points for you. Our AutoCalc is a prime example of how advanced technology should work: it should work for you not against you. The multiple pattern blocks available are central to the ease of programming that conversational provides. Patterns include loop rotate, loop translate, loop linear, loop angular, pattern locations, scale, and mirror image. Why Hurco? Our Mirror Image is the best in the industry. For example when you climb mill the original shape and mirror image the other half, the spindle will continue climb milling around the other half. The multiple hole cycle blocks take the pain out of drilling, tapping, and boring. Choose from center drill, drill, rigid tap, counter bore, bore, spot face, and counter sink. All of these can be applied to a bolt circle or individual XY locations. Use our custom drill cycles to control every move the drill makes. Select the hole canned cycle needed, and a one page screen provides a simple means to enter the dimensions. Nobody gets you from print to part faster than Hurco. Allows you to apply conversational features, such as pattern operations, scaling, tool probing, part probing, and unlimited work offsets to NC programs. Patterns include loop rotate, loop translate, loop linear, loop angular, pattern locations, scale, and mirror image. Benefits: Saves time. Provides unlimited work offsets. Simplifies programming. Simplifies editing of existing part programs. Not only do you have the ability to add true type fonts to your parts, you can place the letters along a contour, place them horizontally or vertically. Parts can be serialized based on letter and number combinations you define. The control will automatically increment the machined serial number each time the part is run. The control can also accept text files with pre-defined serial numbers. The control's interface allows you to quickly switch back and forth between inch and metric during programming or machining. All display and program data is automatically converted. You can quickly enter stock geometry to show the true stock shape during graphic simulation. Why spend 30 minutes aligning your part to the machine when you can spend 30 seconds aligning the machine to the part with Hurco's conversational part probing? Setup is a snap because the probe finds the part and determines its position on the table, including the skew angle'there's no need to align the part to the machine using edge finders. Hurco' s tool probing routines make tool setup faster and more accurate. It reduces setup time by intuitively helping you set the tool length and diameter manually or in-process. Why Hurco? We make it incredibly easy' no complex NC macros to master and edit' just common sense conversational data blocks. Creates complex surfaces within one conversational block once you define a 2D surface and sweep that surface along a contour. Benefits: Reduces programming time by as much as 80 percent depending on the part. Optimizes the tool path and achieves exceptional surface finish with user-defined step-overs and direction of cut.Improved surface finish quality due to continuous tool path. While you're running one part, you can program another job right at the control. Concurrent Programming is another example of our dedication to continuous productivity on the shop floor. The multiple canned cycle blocks stored in the control are the cornerstone of how conversational makes programming fast and easy. Canned cycle blocks available include circle, frame, face, ellipse, slot, polygon, thread milling, and lettering. Select the canned cycle needed to cut the feature desired, and a one page screen provides a simple way to quickly enter the dimensions. Database that stores tool parameters by part material in the control, along with feeds and speeds, so you can recall them for future part programs. Enter information once and you' re finished. Benefits: Saves time by simplifying programming and setup. Lets you capture shop knowledge of safe cutting speeds. Promotes true shop floor automation. Sophisticated capabilities streamline setup.Stores 9,999 tools selectable from 27 tool types.Includes tool length and tool wear offsets.Automatically calculates feed rate and spindle speed in the program when you set tool cutting speed and chip load.Includes absolute tool length for offline tool pre-setting support.Sister tool support lets you define backup tool for quick change if tool breaks or you' re out of stock.Tool notes. The control provides all internationally standardized tap sizes, with a straight-forward slider bar for quick selection. The control programs the selected size for you...it's that easy. Tool Change Optimization analyzes the part program and automatically reduces the number of tool changes by rearranging the program for optimal efficiency. But you're still in control' you can turn this feature on and off for the entire program or a specified section. 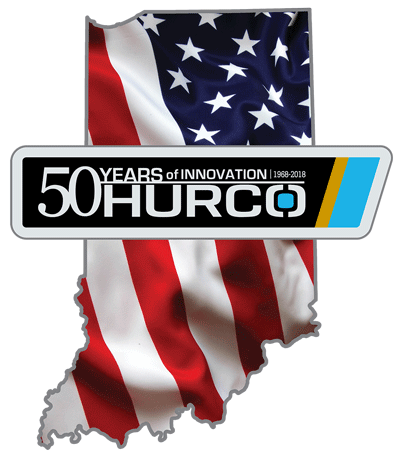 Hurco revolutionized the machine tool industry in 1978 when our co-founder, Gerald Roch, developed shop floor programming for mills, dubbed Hurco Conversational. Powered by our WinMax®control software platform, conversational is better than ever with an enhanced graphical interface, simplified programming, and intuitive software features that eliminate redundancy. Simply put, conversational programming with WinMax® will save you time and give you peace of mind—especially when you need to hire/train employees because it uses "machinist language" so it is easy to learn and easy to use. No need to invest in a CAD/CAM system or hire an experienced G-Code machinist. Our conversational programming method steps you through the programming process visually. Four steps and your machine will be making chips. STEP 1 Part Setup Load the stock on the table and establish a Part Zero (work offset) that will be the program reference point. STEP 2 Tool Setup The WinMax® Tool & Material Library makes setup is even easier. Set up each tool one time and you're finished—the parameters are stored with the control so you just recall the tool the next time. STEP 3 Part Programming The graphical user interface of WinMax® makes programming easy and straightforward. Not only does a well-designed user interface increase productivity and minimize frustration, it also minimizes the learning curve for new employees so they spend less time training and more time contributing to the bottom line. STEP 4 Graphical Verification The Advanced Verification Graphics with 3D solid rendering of the part, including dynamic rotation and real time tool display, make proving out the part a snap. View the part from any angle without needing to redraw it. To learn more about specific conversational features of the Hurco mill control, simply click on a picture in the carousel above and the text appears in the box to the right. Pay special attention to features denoted as Hurco Exclusive or 5-Star—these ratings were assigned by our Applications Engineers, based on their industry/machining expertise and customer input.